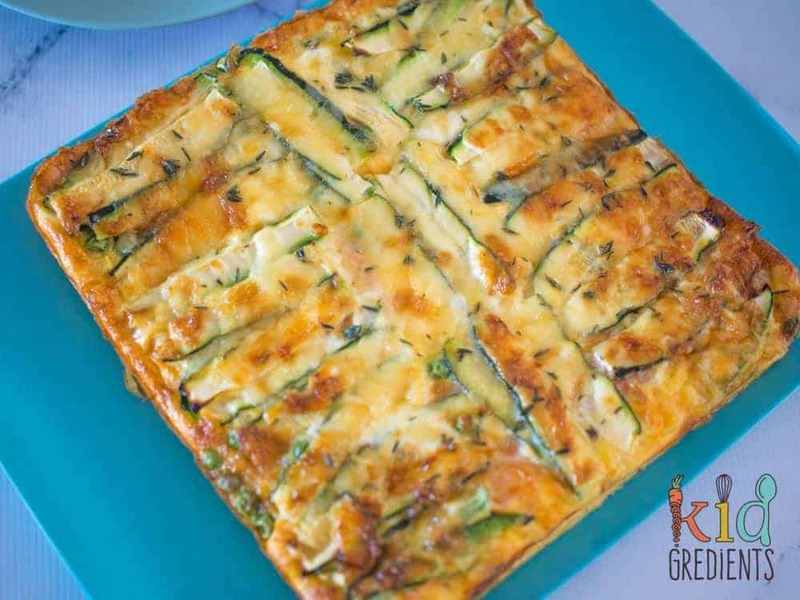 This recipe for sweet potato and zucchini strata bake now has a video! 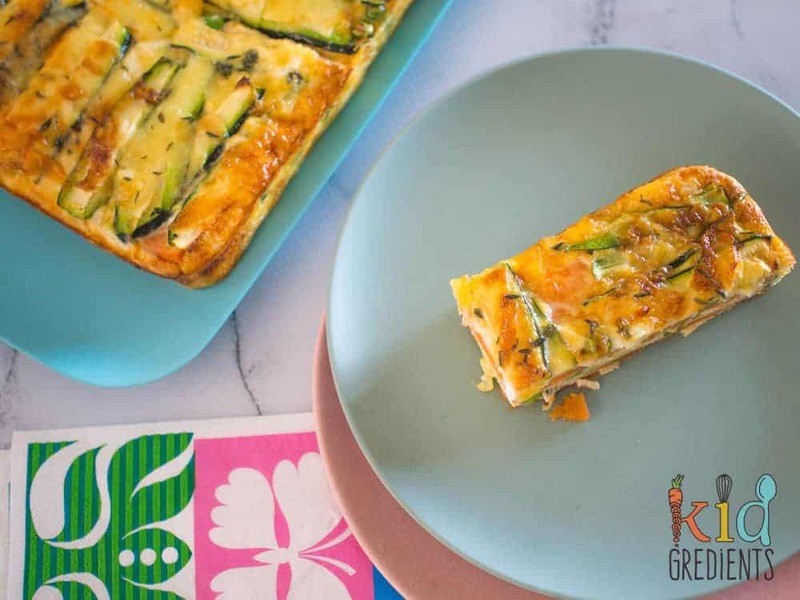 So strata bakes, they usually use layers of bread and other stuff to fill up the tray, but for this sweet potato and zucchini healthy strata bake…I’ve ditched the bread! All of it has been replaced with thinly sliced sweet potato and zucchini and as a bonus, there are even corn and peas in there! That’s a big step towards the 5 a day veggies we should be having! And it’s designed for breakfast time. It almost looks too good to cut! 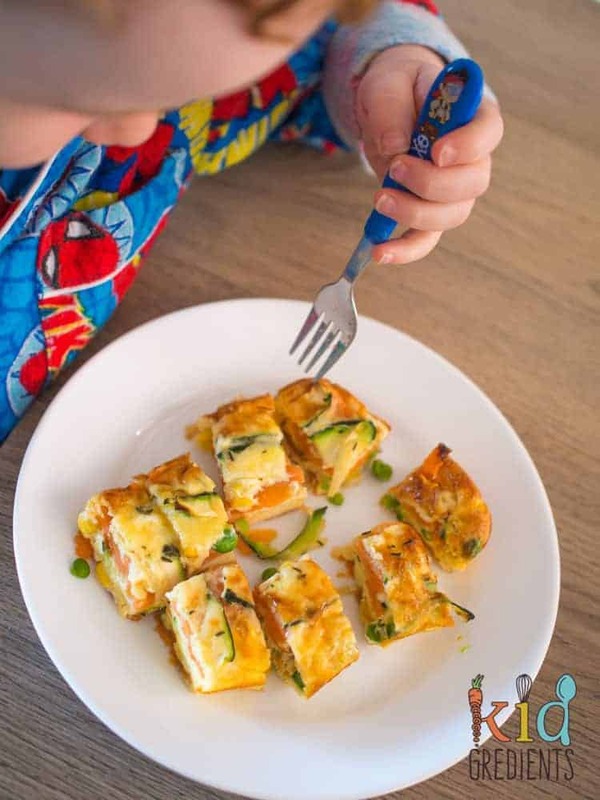 If you’re looking for a way to increase the protein you’re giving the kids at either breakfast or lunch, this is a perfect way. In fact with this many veggies, it also makes an awesome dinner for nights when you need something quick and easy. I freeze in portions and defrost as needed. I either leave it in the fridge to defrost or if we need dinner in a hurry, I quickly microwaveit. 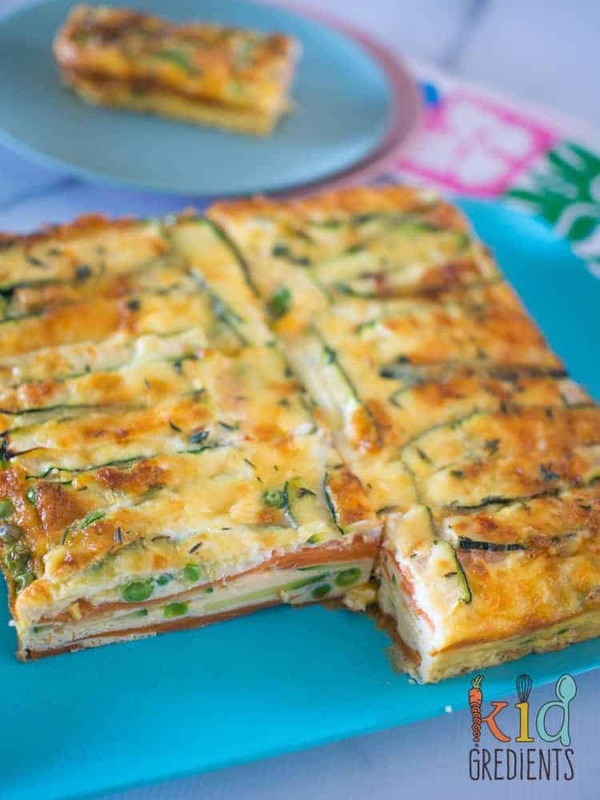 Now the usual strata bake would have layers of bread, so the layers of veggies make this much healthier. By all accounts it also makes it much yummier! And yes I guess I could call this is frittata, but that’s just boring. And anyway, it’s the layering that makes this look so appealing. Layer upon layer of veggie yumminess! If you’re looking at this wondering about other times it would be great: think summer picnics! This is perfect for sharing. I’ve cut this one into 10 but…they are generous slices, and it could easily have been cut into twenty pieces if it was part of a sharing lunch. Or double it and feed even more! The great thing about this apart from the fact that it’s delicious hot or cold…is that the veggies help to hold it all together as they are in strips, making it transportable. 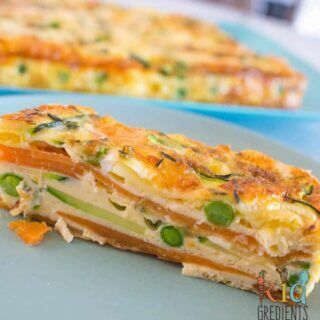 If we’re going to get 8-10 serves of veggies in every day, we need whatever help we can get, so this sweet potato and zucchini healthy strata bake helps you start the day with veggies! Just about to stab his breakfast! Check out the new video for this recipe! Preheat oven to 180 / 355F degrees. Thinly slice the sweet potato. Steam, boil or even bake until just tender- you want it bendy- not smushy! In the base of a 20cm square cake tin, place a thin layer of the sweet potato followed by 1/4 cup frozen peas and 1/4 cup frozen corn. 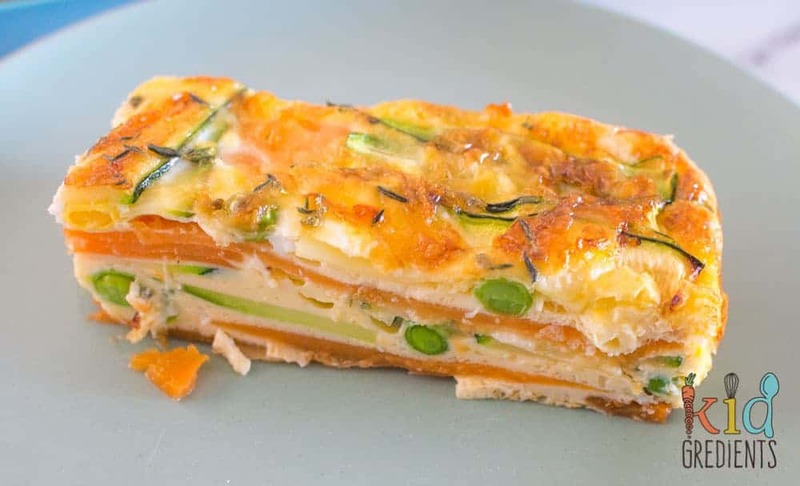 Top with a layer of zucchini. Mix the eggs with the cream and 1/2 cup of the cheese in a jug. Pour over the veggies in the cake tin. Top with 1/2 cup cheese and the thyme. Bake at 180 degrees for 25-30 minutes or until golden and set. Cool for 5 minutes before serving. You can freeze in slices. And defrost overnight in the fridge before putting in the lunchbox. Hi. Can you suggest anything g I can trade in for the zucchini? Would bread work? you could use more sweet potato? Bread probably would only work if you also upped the wet ingredients ratio. I made this according to the instructions and let it cook longer than the recommended time based off of the comments. It was still liquidy and uncooked in the middle. Ended up putting it in again for an hour which helped. I would cook this at a higher temperature. Also, instead of mixing the cheese with the eggs and cream, put it in between the two layers. Otherwise the majority of the cheese just sits on top. I’m sorry you had such troubles with this! I’ve never had issues with it not cooking during that time. I have a fan-forced oven and the temps I have specified as well as the times are for that, and in degrees celsius. It’s so versatile too Adrienne, swap for what you’ve got! Hi Rose, I live in Australia we use celsius- 180 degrees is referring to 180 degrees celsius. The 355f is for the fahrenheit people. You bake at the same temp you preheat at. I’ve never tried it without cream! The cream helps it to all stick together as it works with the cheese in cooking and kind of turns into glue! If you have any success let me know! Yay! So glad you enjoyed it. Easy to make is one of the most important things when it comes to cooking! I can’t seem to find a printable version of the recipe. Am I missing something? I would love to make it, but would like to print the recipe to save. Just under the image on the recipe card is a big button that says PRINT RECIPE. That should allow you to print! Hi Iris, I can see it on mobile! Under the video is the recipe card and it says print recipe. There can be a difference in moisture if you don’t have a fan forced oven, and if you use a different height in the oven. Also check that the veggies are well drained, excess water is no your friend here. I was just wondering if this can be prepared the night before and bake in the morning? Btw, what is your egg size? I get the Port Stephens 18 free range eggs- i have no idea what size they are, as the box is long gone. But I think they are “large”. And yes, I prep the night before and either heat up or serve cold. Hi what kind of cream did you used? Thanks. Yeah! No worries!They’d be fine! Ooh. I don’t know why? Maybe your eggs were much larger than mine? I’ve made this lots of times and it’s never had too much liquid! I’ve done a video of me cooking it- it’s going live on my facebook in a week or so! Hopefully that will clear up any issues! Zucchini is VERY moist, so I find that it needs to be salted first to pull out the moisture in recipes where it’s sliced or in noodle form, or if it’s shredded then I wrap it in a clean kitchen towel (or put it in a colander) and squeeze out moisture over the sink before adding it to a recipe. To salt it – cut your zucchini slices, lay them on paper towels or clean kitchen towels with a plate under them, and sprinkle salt over the zucchini, then repeat with additional layers of paper/kitchen towels, zucchini slices, and salt; leave that to rest for 20 minutes or so, then use the slices in the recipe. It’s more labor intensive, but can really help with the moisture issue when cooking with zucchini!